Subtitle – It was priceless, and this isn’t a credit card commercial. I didn’t make it up, it is Francis’ blog on Gourmet.com. A warm and inspiring ode to love, friendship, sharing and panettone. With regard to the “priceless”, I couldn’t agree more. This year we ran out of panettone the day before Christmas; having to supply our own homes, we bought the best available panettone in NYC. 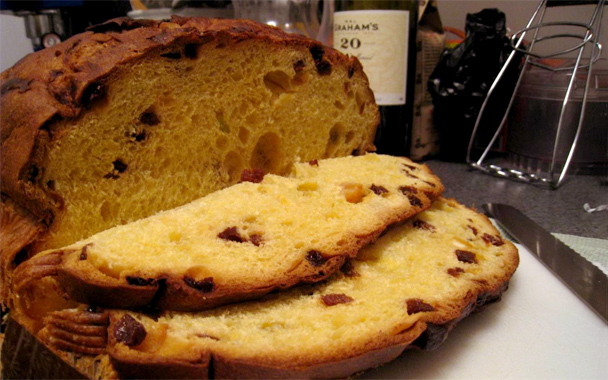 It was dry and heavy; a different product than panettone; almost unedible. Our point is: you don’t have to have it. But if you want it, you must get the real thing. This is true for panettone and everything else.